Luxurious 3-bedroom apartment (outlined in red on photo), sleeps 6+, in the secure and spacious Domaine des Lavandiers with its own swimming pool. Ideal for families with children (cot, high chair, buggy provided). .
WiFi Internet access included - suits people who need to keep in touch. Apartment has a 15m2 terrace not overlooked with views of the Maures hills. Secluded beach only 5 minutes walk away and 10 minutes walk takes you to the centre of Cavalaire, pleasure port and the main beaches on the bay of Gigaro. St Tropez, Port Grimaud, St Maxime and le Lavandou are within 25 minutes drive. Good Carrefour supermarket within 3 minutes walk. Coastal cycle track to Levandou starts nearby. Wonderful walks on the coast and the Maures hills. Child and adult bikes and some beach equipment included. Retired telecommunications consultant. Runs a baroque music society. Excellent location, comfortable beds, good wifi, bikes and beach equipment included. Cavalaire is considered by Daily Telegraph to be one of the top French seaside towns see http://www.telegraph.co.uk/travel/family-holidays/Holidays-with-teenagers-the-best-10-beaches-in-Europe/ I stayed in Cavalaire over a weekend on a business trip and found the area so attractive that we bought the apartment. One of our first clients also bought an apartment in the same domaine. Many of our clients have been visiting Cavalaire for many years. Cavalaire is the "family person's St Tropez" Beaches and shops are in easy walking distance. It is quieter and safer than the main Cote d'Azur from St Tropez to Nice. The apartment is on a spacious Provencal styled development with its own gardens, swimming pool. It is on the third of four levels and there are two lifts in the building. The master bedroom has its own shower and separate toilet. One of the twin bedrooms has full size bunk beds. The bed in the lounge can be used for one additional person. All the beds are new and very comfortable, and are 200cms long apart from the bunks which are 190cms. Blankets are provided. Heating is by reversible air conditioning in the lounge and radiators in all bedrooms. The south-west facing terrace is not overlooked and has 3 sun loungers, a table with 6 chairs and a large sun awning. The apartment is finished in Provencal white plaster and decorations use Provencal blue and yellow (very attractive!). The underground garage is lockable and spacious. There is air conditioning in the main room and it also acts as an air heater in winter. We had a lovely stay in this apartment -- the apartment block is very safe , has a nice pool and is within a 10minute walk of the port . There is a lovely beach within a 10/15 minute drive . We thoroughly enjoyed our stay and have already recommended to friends ! Having visited many of Provence's towns over the years, this was our first visit to Cavalaire. We really liked it: it is a friendly family-centred resort set in a beautiful bay. There is a very nice marina, lovely beaches and scores of restaurants. Usually I take the car on long daily drives, and on this occasion did not budge for the final three days! The apartment itself if exactly as advertised, and it is extremely well located in what is one of the nicest developments in Cavalaire. I really loved the south-facing spacious terrace, with its vista of trees and greenery, yet only a few minutes from a Carrefour, five minutes from Bonporteau beach (morning swims), and only 10 minutes from the 1,000 berth marina. We also really appreciated the air-conditioning at night as the weather was very warm, and the children loved the swimming pools in the Lavandiers for their evening swims. The complex is very well maintained; during our 9 day stay the gardens were tended twice and the common areas cleaned three times, and it shows. The apartment has everything needed for a holiday, and the owner was very good in responding to all queries from the start. I would absolutely recommend this for a holiday, and hope to return in the near future. We first rented the apartment in June 2006, and found everything there for our 3 yr old and 3 month old. We returned in 2013 and we're equally as impressed, especially with the addition of air conditioning and an awning, both being ideal with the heat of the sun. The apartment is probably in the best location in the complex, with views of the hills. Even in peak season it was very quiet with not many other apartments being occupied. The swimming pools were generally very quiet, and the shrubs around the complex have developed well. The buildings also seem to be in the process of being reprinted, to spruce everything up. The apartment itself is very well kitted out, especially for families, with a selection of bikes as well as beach equipment and other equipment. We spent two weeks in the apartment with two young boys (4 ½ and 1 ½) and it was a wonderful stay. The apartment has all possible facilities, even with young children. The residence is secured and swimming pools are under the watch of a lifeguard. It is also located close from the center town and the beaches. The Carrefour market is only two hundred meters away, which is really convenient. No doubt we will come back next season! very nice and clean appartement with a large balcony in the 2nd floor, the description of the appartement and property, location etc. was very accurate, the owner was very friendly and gave very comprehensive information also about the area (e.g. way to the beach, supermarket, restaurants etc. ), our expectations have been fullfilled, we can recommend this property! We really enjoyed this great apartment. Practical, well placed, very clean, with all equipments needed, well laid-out apartment. Besides owners are very kind. Thank you, delighted your holiday went well. We have had many useful suggestions from tenants that we have followed. Cavalaire is a quiet seaside town between St Tropez and le Lavandou, 25 minutes from each. 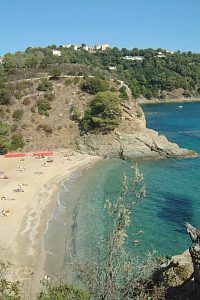 It is 2 hours drive from Nice airport and less than one hour from Toulon/Hyeres. It is also accessible by bus from the railway stations at Hyeres and St Raphael. There are boats from the port to St Tropez and the Iles d'Or. The initial deposit of 25 % is non refundable in case of later cancellation. We will offer attractive special rates for stays longer than 2 weeks in autumn/winter/spring please ask.